If you’re a Twin Peaks fan, the words: “The owls are not what they seem” will send shivers down your spine – and whether it’s fear or excitement, well, it’s difficult to choose. That’s why the much-hyped Twin Peaks pop-up was a must-do for a Lynchian geek like me – and Diane, it was damn fine. SPOILER ALERT: don’t go on reader if you’re trying to save yourself the surprise. Friday night: I show up at the secret location in Farringdon with a friend to mourn Laura Palmer’s death with what I can only imagine is a coffee-based cocktail. In full Lynchian fashion, we are encouraged to dress up: I go full-on widow style. We descend underground to find a neon sign reminding us that the owls are not what they seem, leading us to the entrance of Twin Peaks’ American style high school. 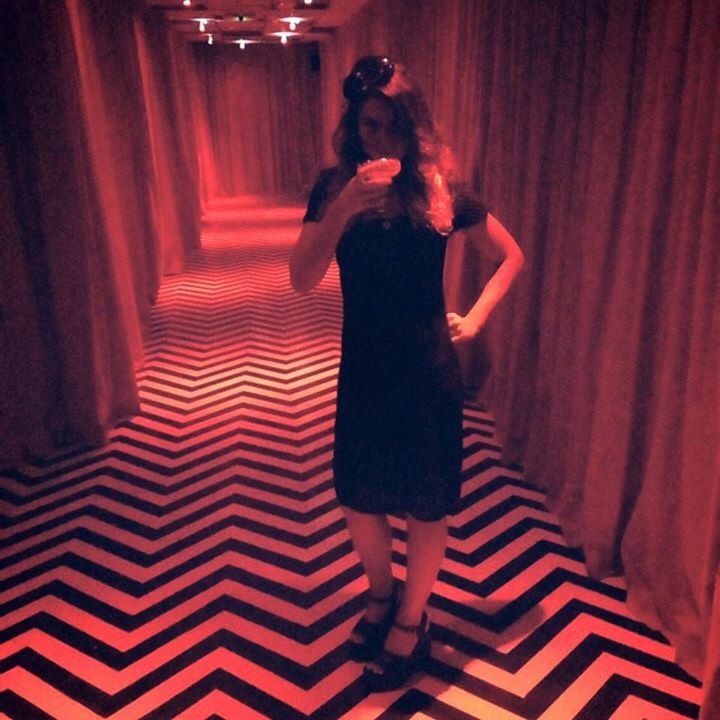 We’re guided through a darkened room with a seatless chair behind a curtain, and we walk tentatively towards the red light: it’s the Black Lodge’s Red Room in full swing, with no furniture or doors, everything hidden behind a set of red curtains in contrast with the floor’s chevron pattern of black and white. We walk through the deserted lodge alone, slowly, watching our backs instead BOB shows up. Then we’re onto the bar, where the barista who mixes our aptly named cocktails the Cherry Bang or the Full Moon – made respectively with cherry liquor and damn fine coffee – looks suspiciously like Twin Peaks’ Julee Cruise. “Hint: explore all the rooms,” said the team behind the Not What They Seem pop-up. We oblige. We leave our table at the bar – where someone had left another bag of “cocaine” – to go up some dimly lit stairs, walking through what appeared to be a fire door, only to find ourselves in an empty laundry room with Laura Palmer’s body wrapped in a sheet. As we stare at the body, transfixed, the local drug dealer appears right behind us and we let out a scream. He leads us back into Laura Palmer’s bedroom, its pink walls and well-made bed calling for something terrible to happen. But we survive it and we go back to the bar, only to find ourselves in a basement with wood chips, malfunctioning TVs and tape recorders hanging from the walls and talking to us about the most random things you could imagine. We celebrate the night with another cocktail, on the bar’s stage, dancing to the Twin Peaks themed music occasionally interrupted by the cracking sounds of the Black Lodge. Launched this weekend, London’s Twin Peaks pop up is a triumph of the weird, allowing fans to delve into the series’ surreal view of small-town America with all the daunting yet alluring details of David Lynch’s cult show. Even the toilets – with writings on the wall such as “I’ll see you in 25 years” and markers to leave your own contribution to the bar – were crafted to please even the most fastidious of Twin Peaks fanatics. Actors and music make the experience even more memorable – and it’s no surprise, since the immersive experience was designed by events specialists Lemonade and Laughing Gas and Blanch & Shock. The pop-up has both the option to have dinner at the Double R Diner (tickets are a whopping £65) and to have a drink at the bar (£5). Dinner guests will be treated to a three-course meal, which will include a twist on a damn fine cup of coffee alongside a slice of cherry pie. If you wish to look the part, dress code is surreal small town / extravagant Lynchian chic – think Agent Dale Cooper and his dapper suits, Shelley and her waitress uniform or the Log Lady … Prizes will be awarded each evening for those who have dressed up. This is a pop-up that David Lynch would approve. Over and out, Diane. Hey Audrey! Nice name btw 🙂 the cocktails are about £7 – totally worth it!